Rich, buttery, tender Pink Lemonade Pound Cake smothered with delectable tangy Lemon Buttercream frosting is wonderfully delicious and perfect for birthday parties, baby showers and Labor Day! But while we’re talking about baby showers, this Pink Lemonade Pound Cake is in honor of my friend Sally of Sally’s Baking Addiction who is expecting her first baby next month! We couldn’t be more excited for Sally and her husband, Kevin so some blogger friends and I are throwing her a virtual baby shower! 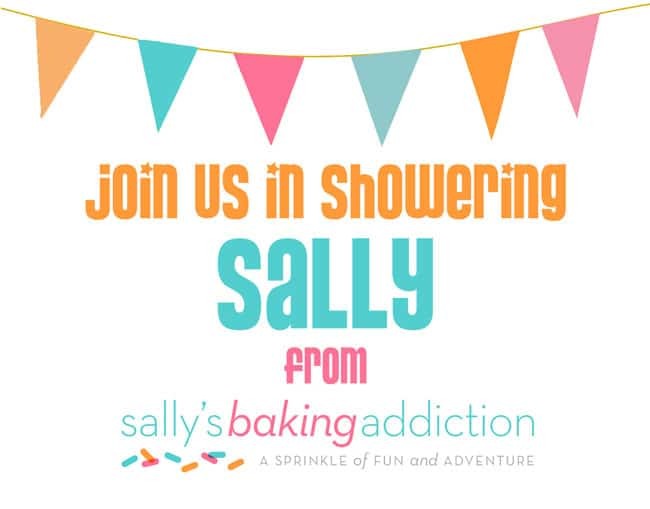 If you aren’t familiar with Sally or her blog, she is the creator of the number one dessert blog that is my go-to for desserts. In fact, I made her famous Salted Caramel Dark Chocolate Cookies last year for neighbor Christmas goodies and they were the hit of the crowded cookie plates! All her desserts are reliable/no fail, and easy-to-follow. And just like her desserts, Sally is as perfect and sweet as they come! 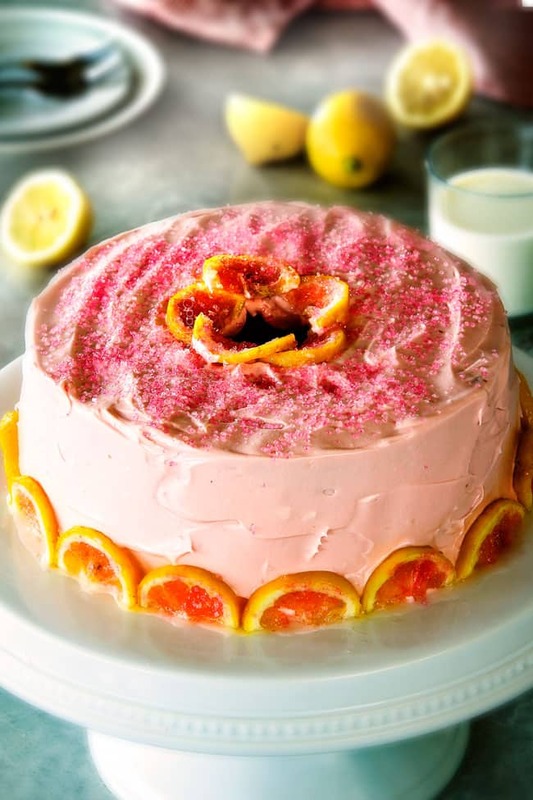 So let’s celebrate Sally and her eagerly anticipated new arrival with this exquisitely delicious Pink Lemonade Pound Cake and the rest of these blogger friends fabulous desserts! With Lemonade frosting, yes, yes it does. 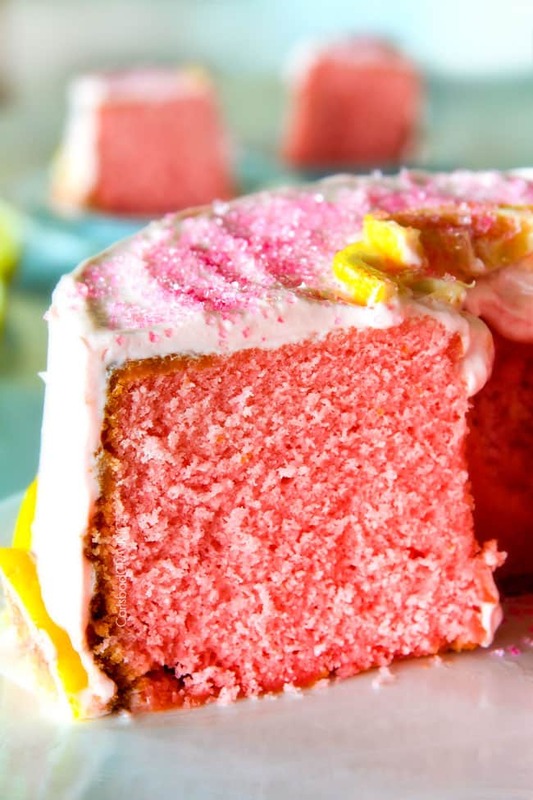 The Pink Lemonade Pound Cake’s richness demands an equally show stopping frosting. And this Pink Lemonade frosting, my friends, is ridiculous. It is silky sweet and tangy and really tastes like lemonade in frosting form. Now the trick to buttercream frosting with the perfect consistency is to never microwave your butter or cream cheese. I have been guilty of this and wondered why my frosting was runny and hard and hard to spread. 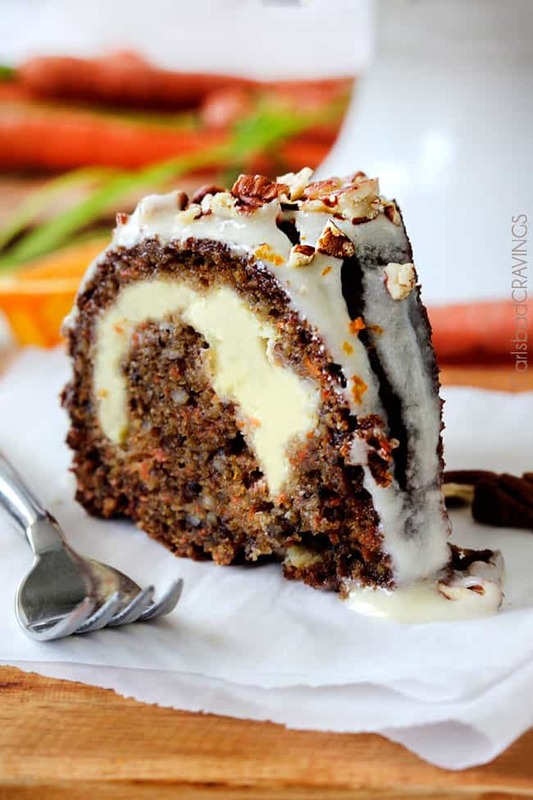 If you allow your butter and cream cheese to soften at room temperature, you are guaranteed the perfect frosting every. single. time. To make this Pink Lemonade Pound Cake extra special, I candied some lemon slices which might sound difficult but is actually wonderfully easy – but again, is purely optional for looks. To candy lemon slices, simply dissolve sugar in water over medium heat, add your lemon slices and remove from heat. You let the lemon slices cool in the syrup then transfer them to a wire rack to drain then sprinkle both sides with sugar and sprinkles – viola! The prettiest lemon slices you have ever seen! So here’s to Sally and her new baby and here’s to you and your big slice of tangy, sweet, rich Pink Lemonade Pound Cake. So you can taste a slice of summer all year round! 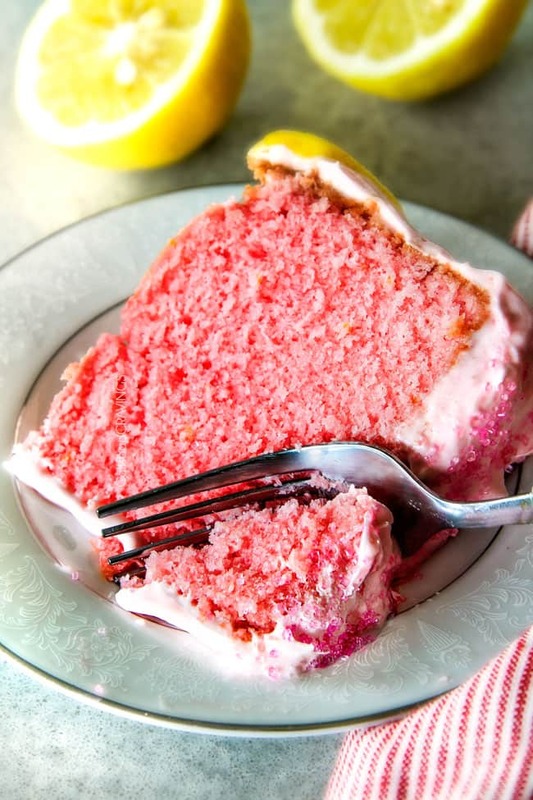 Want to try this Pink Lemonade Pound Cake? Pin it to your DESSERT, CAKE or SUMMER Board to SAVE for later! Rich, buttery, tender Pink Lemonade Pound Cake smothered with delectable tangy Lemon Buttercream frosting is wonderfully delicious and perfect for birthday parties, baby showers and Labor Day! You can even leave out the red food coloring for simple Lemonade Pound Cake for every occasion! Preheat oven to 325 degrees F and generously spray all surfaces of a 16 cup nonstick tube pan with nonstick cooking spray WITH FLOUR*, OR grease and flour the inside. Set aside. Sift the 3 cups of flour, baking soda and salt into a medium bowl and set aside. Beat the butter until creamy then add sugar and beat until fluffy, scraping sides down as needed, about 7 minutes (beating the full 7 minutes results in a fluffier cake). Add food coloring and mix until combined. Add eggs, one at a time, beating until just the yellow disappears after each egg. Stir in sour cream and vanilla extract just until combined. Mix milk and lemon juice together. With mixer running on low, gradually add flour mixture to butter mixture in thirds, alternately with milk/lemon juice mixture in between each third. Beat on low until just combined. Spoon batter into prepared pan, smooth top and tap pan on counter a few times to release air bubbles. Bake until a wood pick inserted near the center of cake comes out clean, 80 – 90 minutes, taking care not to overbake (overbaked cakes are not as moist). Let cake cool in pan for 20 minutes then remove from pan, and let cool completely on a wire rack. Combine 3/4 cup sugar and water in small saucepan over medium heat. Whisk constantly until sugar dissolves. Add lemon slices and bring to a simmer for 15 seconds. Remove from heat and let sugar and lemon slices cool completely, about 45 minutes. Transfer lemon slices to wire rack to drain, about 5 minutes. Sprinkle both sides with remaining sugar. Generously sprinkle top sides with pink sprinkles. Beat butter and sugar with handled mixer at medium-high speed until light and fluffy, about 2 minutes. Add cream cheese, 1 piece at a time, beating thoroughly after each addition. Add lemon juice, vanilla and red food coloring and beat to combine. Evenly spread frosting over top and sides of cake. 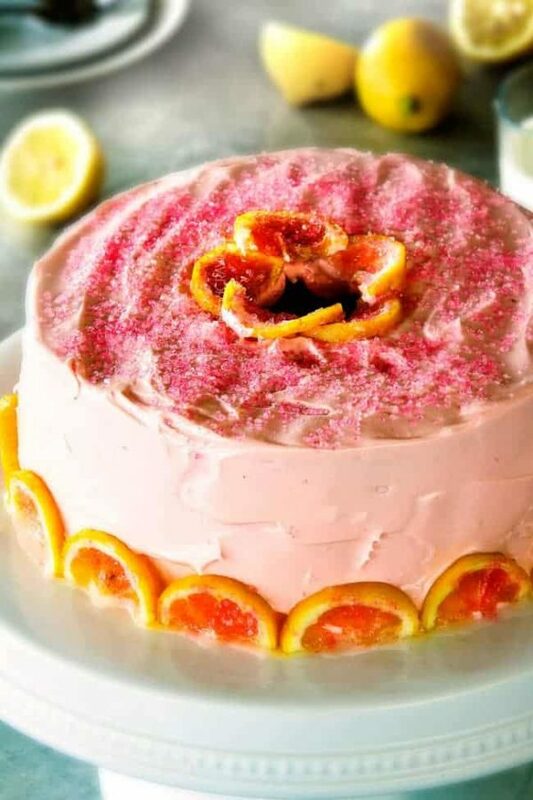 Sprinkle with pink sprinkles and place lemon slices along bottom edge of cake (optional). *You need to use a 16 cup tube pan for this recipe. 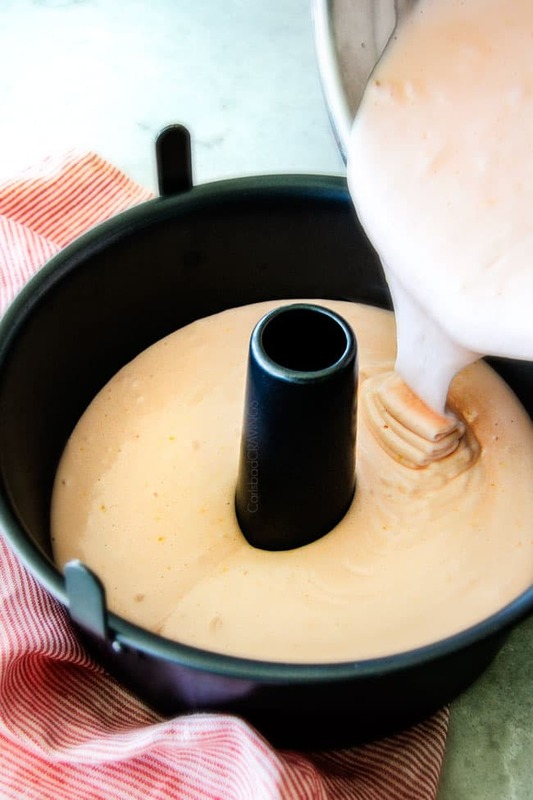 A bundt cake pan will NOT work in this recipe because it does not have enough volume. **Let cream cheese and butter soften at room temperature. Do NOT soften in microwave or frosting will be runny. I am so impressed! 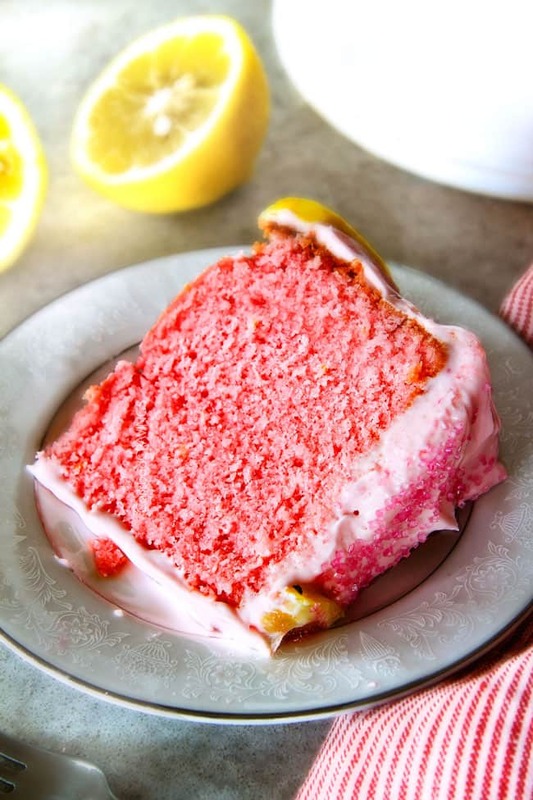 A gorgeous scratch pink lemonade pound cake….swoon! It’s so beautiful! I’d love a huge slice! Thank you friend! I wish we were eating it together :)! I love this SO MUCH! What a gorgeous color and awesome idea for adding flavor! I have actually never made a pound cake… Is that awful of me?! I must use your blog as a guide when I get to do it someday hopefully soon! You are so sweet, thank you so much Lynn! And you will love pound cakes! They are so rich and melt in your mouth! Wow! 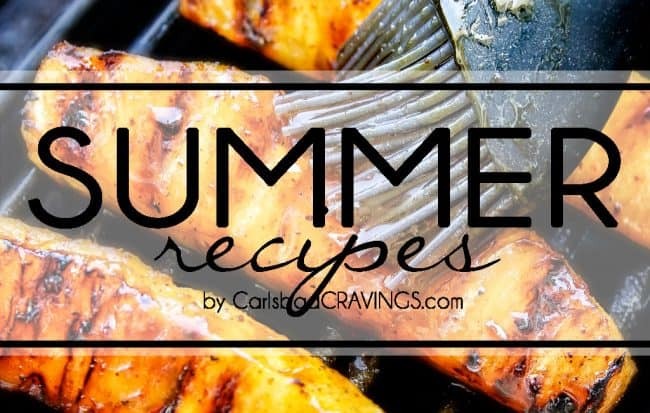 Beautiful summer recipe! 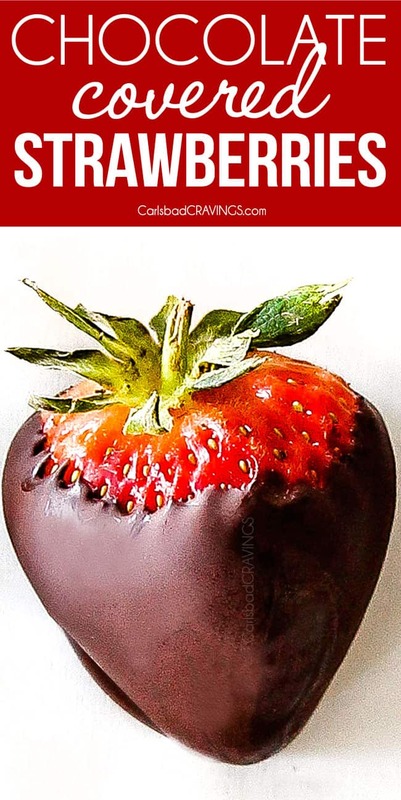 I will have to try to make this while the weather is still warm. Lovely recipe, thank you!! You are so welcome Laura, I hope you can make it soon and love it! Thank you! Thank you so much Rachel, what a thoughtful comment! I love photographing food – a huge part of the job that I didn’t know I would enjoy so much! I am so happu to hear you are enjoying the Lemon Poke Cake Recipe – another lemony fav of mine! I hope you love this one just as much! I am a lemon fan! I made pale yellow icing, the lemons contrasted beautifully, for our neighborhood summer picnic. We are still no rain for 70 days, everything is tinder and will burn so easily. Forests are on fire, in of all places normally rainy western WA. I used the oven around midnight so I could also run the dishwasher after the night air cooled down. The house smelled so yummy. Everyone loved the cake, a very beautiful and tasty dessert. Your cake sounds beautiful and what a perfect cake for a neighborhood picnic! I am so happy everyone loved it! I hope and pray you get rain soon!!! I made this today! I only had neon pink food coloring, but it definitely kicked up the color intensity! My lemons didn’t take the color as nicely though. So while they tasted good, the pink sugar on the sides kinda dissolved into the slices and took away from the visual. Taste was fantastic though, the frosting in particular was a big hit! I am imagining a neon pink cake and absolutely loving it! And I agree, the frosting is a show stopper in itself! Thanks Lindsey! hahahaha! I just changed the recipe, thanks Layne! I can’t believe no one else has caught that! I hope you liked your SUPER pink cake!